The temperatures are still fairly high, but definitely a relief from the boiling 100+ degrees we endured this Summer. With thoughts of Fall weather in our heads we can start planning our diets to fit cooler times. 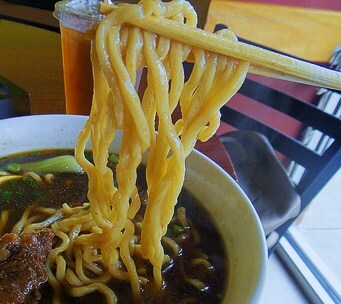 One of my favorite restaurants in the Dallas area is a tiny shop in Richardson called King’s Noodles. Spartan, tiny and often crowded, delicious are a few words to describe King’s. There are a few top-notch dishes that scream at me as I pass the Main Street exit in Richardson. But when it is steamy hot and my sunglasses are fogged over, it is difficult at best to consider hot soup. 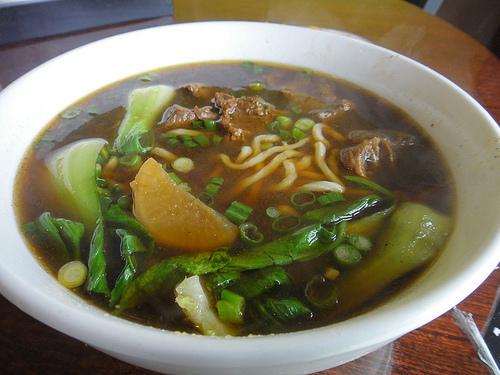 The order of the day is the Beef Stew Noodle Soup (5.95), which has large chunks of traditional beef stew meat that’s well marbled with small layers of fat to break up the chew of the beef. Along with a myriad of vegetables such as baby bok choy and carrots, you are also supplied traditional Taiwanese hand-made noodles that are a bit on the thick and chewy side that renders this meal even heartier. If you have a bit of a sweet tooth, consider a dessert of Ice Cream Shaved Ice that consists of shaved ice, sweetened condensed milk and a dollop of ice cream. All this is topped with fresh fruit which could be strawberry, mango or melon. The large portion is easily shared. Other dishes not to be missed include the minced pork and garlic, Zha Jiang Mian, and the cold tofu (more of an appetizer). Bring cash, it is all they accept. I love King’s Noodles – although it is one of many great family-owned spots in the area. I’ve been at a bit of a loss of what to order next there, and you’ve given me some great ideas. Have to head down there soon!